In the last In Harmony Newsletter, Derek Cosburn provided a timely reminder that recognition is a key component of expressing our gratitude to those members of our barbershop community who contribute so much in keeping our clubs, regions and national association thriving. 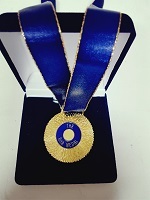 The introduction of the inaugural BHA medal in 2017 was the first time that a member could be nominated by their peers and considered for a national award that recognised their contribution. In 2018, the BHA Medal will continue, and in addition we wish to enhance the focus on Club Member of the Year. Many clubs run an annual acknowledgement of those who contribute and often the timing of that process does not align with the National Convention and the opportunity to acknowledge that contribution beyond the borders of the club. For this reason we are seeking feedback on how the National Council can better facilitate this process and will be discussing opportunities to do this with each region. In the meantime, start thinking about your BHA Medal nominees ready for the call in late May!